‘Be sober, be vigilant; because your adversary the Devil walks about like a roaring lion, seeking whom he may devour’ (Peter 5:8). 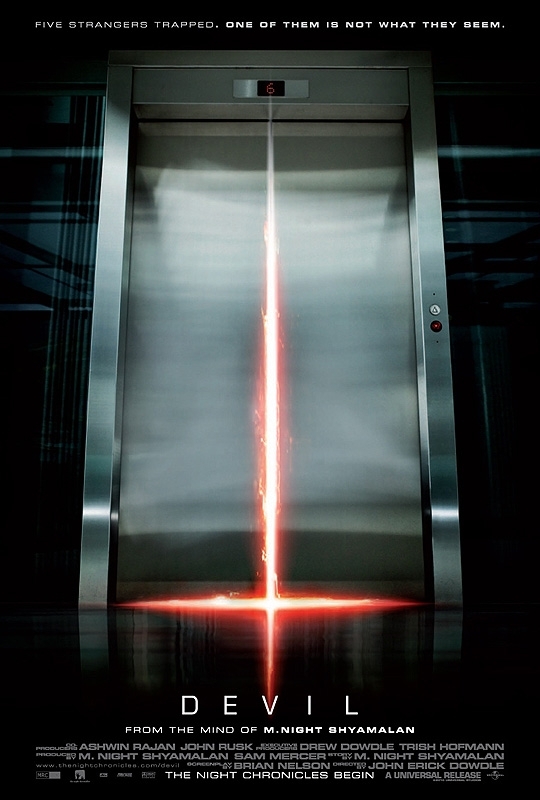 In ‘Devil’, five strangers, all with dark secrets to hide, are trapped in an elevator of an inner-city office building. As they await their rescue, they start to die one by one in a mysterious way. ‘Devil’ belongs to the genre of films which is my favourite – the so-called “confined spaces” or “single location” films. From the screen adaptations of Agatha Christie’s ‘And Then There Were None’ (1945), (1974) to ‘Cube’ (1997), ‘Identity’ (2003), ‘Fermat’s Room’ (2007) and ‘Exam’ (2009), these type of films are often intriguing and engaging, often solely thanks to the strength of well-defined personalities portrayed and the fascinating interactions among them. John Erick Dowdle (‘Quarantine’ (2008)), the film director, said that ‘Devil’ borrowed its main theme from Agatha Christie’s novel ‘And Then There Were None’. This means that the film is quite enigmatic: it introduces a group of strangers with different personalities and experiences, who gather in one isolated location, but with one of them being an impostor with an evil mind who plans to kill all the rest. In that way, in terms of being a psychological thriller, ‘Devil’ is also a fascinating study of human behaviour. The main merit of ‘Devil’ lies in the way it introduces supernatural forces into the everyday world. This shift is not abrupt, as to make the film idea ridiculous, but is rather gradual, and made as realistic as possible. Unlike such recent thrillers as ‘Red Eye’ (2005), ‘Devil’ can never really be perceived as “trashy” or “funny” upon seeing it, and can be remembered just for its unexpected ending, which far suppresses the endings of some of the most recent horror movies, including ‘The Devil Inside’ (2012) and ‘The Woman in Black’ (2012). Also, despite many references to the faith and the devil in the movie, ‘Devil’ is not as overtly religious as most critics laid it out to be, certainly no more so than ‘The Exorcist’ (1973). ‘Devil’ is the first of three films forming part of the series ‘The Night Chronicles’ based on the producer Shyamalan’s (‘Sixth Sense’ (1999)) ideas. The idea behind the film actually comes from the myth about the Devil’s Meeting. According to this South-American legend, the death takes the form of a human being and wonders in search of sinners in order to torture them on Earth. This idea dominates the theme of ‘Devil‘, and, because it seems so scary and fascinating, it makes the film-watching even more interesting. The cast has been heavily criticised in ‘Devil‘, but unjustly so. For example, Chris Messina (Vicky, Christina, Barcelona (2008), Julie & Julia (2009)) as detective Bowden gives a very dignified, convincing performance, as does Logan Marshall-Green as a mechanic in the elevator. For my list of intelligent, complex and thought-provoking films, see here. I’ll check it out thanks. Mention of M Night Shyamalan seals the deal for me! Nice write up buddy. I felt that Shyamalans name on this actually hurt it. The fact that he didn’t write or direct it was why it was so good I felt, and a lot of negative criticism seemed to stem from people thinking M.Night had made it therefore it must be crap before they even watched it. Shame, as I felt Devil was really good.